Aaron Rai: "It's incredible. It definitely hasn't sunk in just yet. I'll probably need a few days for that to happen. 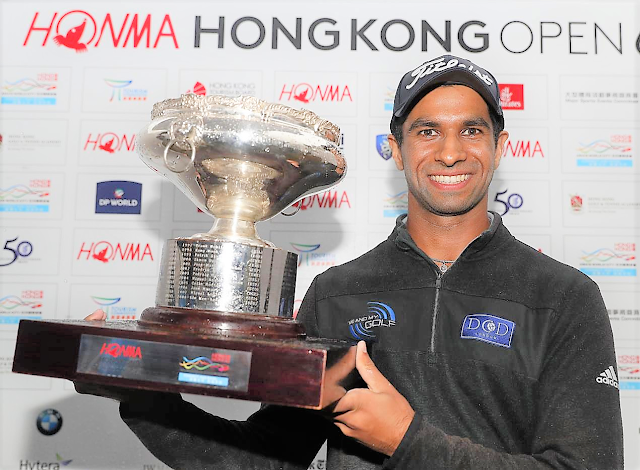 "It's incredible to win on any Tour, let alone The European Tour and let alone the Hong Kong Open. It's an incredible course, incredible event, very well supported. The crowds have been amazing. I'm just very grateful. "Matt played incredibly all day. It was tough but again, I really just tried to play the course as much as possible, rather than Matt, or anyone else who was playing well today. "I luckily managed to do that for most of the way around. It's tough considering the situation but I'm very pleased." “It felt a little bit different today. It's nice having wins in the past which help you kind of in what expect in a sense, but it did feel a little bit different today in terms of just how big it is and the attention of people. Matthew Fitzpatrick: "Obviously it was disappointing on the 17th there, such a simple bogey. But I gave it a good go. It was always going to be tough to beat him. Victor Perez: “It was obviously really difficult with the conditions. I don't think anybody was prepared to get this much rain, but I was able to stick to my game plan and make some good birdies, and obviously a really good round. Jason Scrivener: “It was a long day. We were waiting for it to stop the whole round and just never gave up. Happy to grind out a decent score today and a decent week.